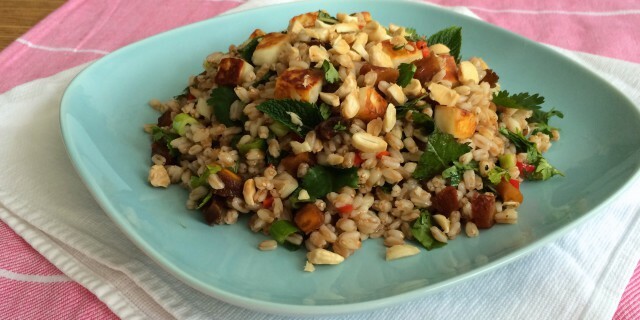 This Halloumi Apricot Spelt Salad with an Orange Chili Vinaigrette is a super delicious and refreshing salad. It can be served as a full meal or as a nice appetizer. The Orange Chili Vinaigrette is fresh, sweet and just a little spicy, which adds a lovely heat to the salad. Recently, I have grown really fond of halloumi cheese. Halloumi is a salty, brined cheese, often made with sheep or goat’s milk. It’s low-fat and really tasty. The cheese has a quite unique texture and flavour and can adds a nice bite to any salad. Fresh halloumi is rubbery and squeaky in your mouth. When fried, the halloumi cubes become soft and creamy on the inside but brown and crispy on the outside. The salty halloumi cheese adds a beautiful contrast to the sweetness of the apricots and Orange Chili Vinaigrette. The fresh herbs and the vinaigrette really help to freshen and lighten up this salad. Rinse the pearled spelt well. Then add to salted boiling water and cook for 20 minutes. Drain and set aside. In a small bowl mix all the dressing ingredients together. Season with freshly ground pepper and sea salt. Heat 1 tbsp of olive oil in a heavy skillet up to medium heat. Then add the halloumi cubes and fry them for a few minutes on each side (without stirring) until they are golden brown. Add the pearled spelt to a large salad bowl. Mix in the apricots, spring onion, the herbs and chopped almonds. Sprinkle the dressing on top and mix it through. Serve with fried halloumi cheese cubes on top.